Happy Saturday! Tax time for the hubby and I, but I wanted to share a couple of projects with you before I head out. Today, to complete my series on Paper Pumpkin®, I want to talk a little about using the supplies you receive in your box to create something totally different from the “instructions”. That’s one of the beautiful benefits of Paper Pumpkin. You are not tied to those written instructions; you are limited only by your imagination. Here, I created an adorable little treat bag using my kit and a few extra supplies I had around my craft room. I started with one of the Stampin Up! ® Kraft Tag a Bag gift bags©; and I randomly stamped it using Crumb Cake ink and the splatter stamp from the Gorgeous Grunge stamp set. I then added the loopy loop Calypso Coral flower from the kit to the front of the bag along with a couple of the leaves and flowers from the kit. 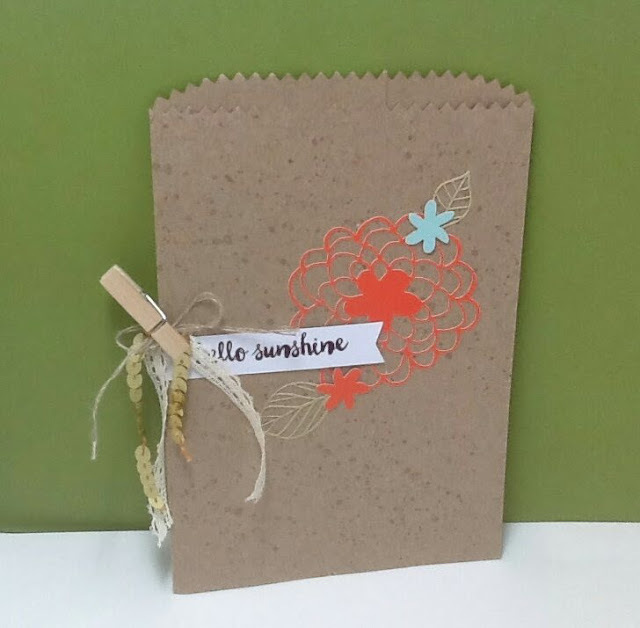 I then stamped a Whisper White banner from the kit with Blackberry Bliss ink with the sentiment, Hello Sunshine, also from the Paper Pumpkin kit and adhered that to the left side of the bag. I then took a 5” piece of Venetian Crochet Trim, a 4 ¼” piece of Gold Sequin Trim wrapped with a piece of Linen Thread and attached that with a wooden Clothes Pin (left over from last months Paper Pumpkin!) Isn’t this adorable? What a great way to present a little treat to someone to say, “you mean something to me and I was thinking of you”. Here is another project/card that I put together using my kit. For this, the only "extra" item that I used that was not in the kit is the 1 sheet of Pool Party cardstock! Everything else is from the Paper Pumpkin kit! For this, I scored and folded a piece of Pool Party cardstock at 4 1/4" after cutting it down to 5 1/2"x8 1/2". I then cut down one of the card fronts from the Paper Pumpkin kit (the one with the Pool Party splotches all over it) to 5 1/4"x4" and stamped the tiny little flower stamp from the exclusive stamp set that comes with the kit, using Blackberry Bliss ink. 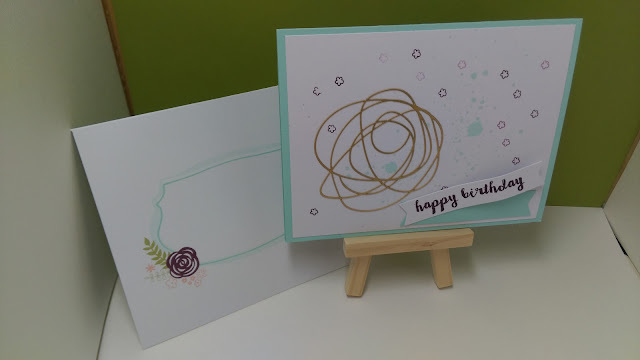 I then adhered the gold "scribble" rose from the kit off center toward the left side of the card. I then cut a 1/2" x 3"" piece of Pool Party and "bannered" the ends and stuck that down to the front of the card, just to the right of the rose, I then stamped Happy Birthday onto one of the Whisper White banner pieces again, using the Blackberry Bliss ink, all of which is included in the February kit and I adhered that down a bit askew over the Pool Party banner. Pretty cute eh? Thank you so much for stopping by. I truly hope you enjoyed today’s projects. I would be eternally grateful if you would leave me a comment and let me know what you think. Also, let me know what you would like to see in the future. And if you would like to give Paper Pumpkin a try, just click hereto join. There are many options to fit everyone. There is a single subscription of $19.95 and you will receive just one kit , there is the 3, 6 and 12 month subscriptions and then there is a recurring subscription for $19.95/month. In order to receive the March kit, you MUST sign up by no later than 3/10/2016. After that date, your first kit will arrive in April. If you have ANY questions, please do not hesitate to contact me, I am here to help!